Patholi is a traditional amchi sweet prepared on fragrant haldi [Turmeric] leaves especially during festivals like Ganesh Chaturthi, Gowri festival, Nagpanchami besides other special occasions. 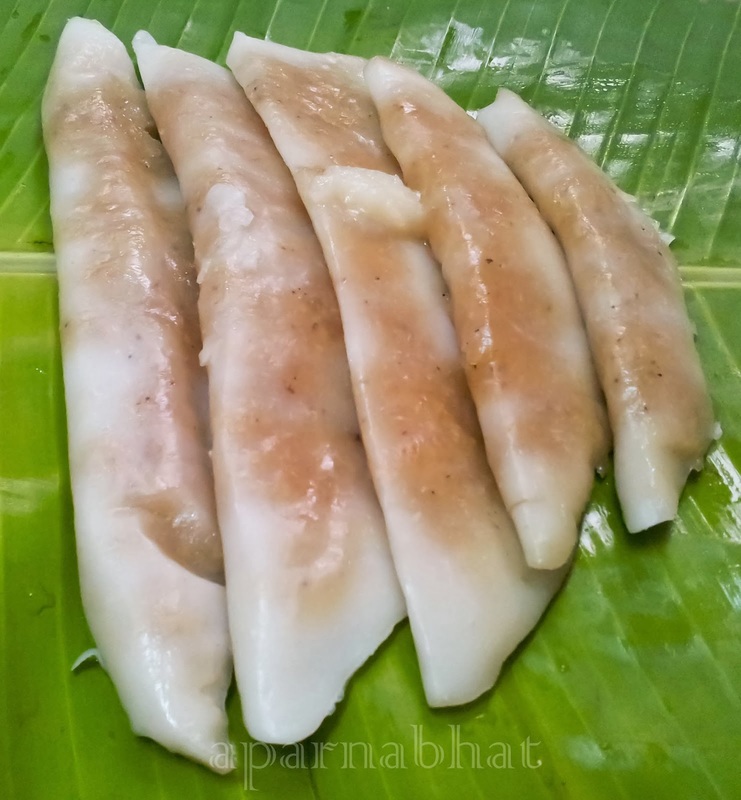 I was not able to locate these leaves at my place and so decided to prepare them on banana leaves [Had read about the use of banana leaves for making patholis/ada on internet, here, here and here]. This lacks the heavenly aroma of turmeric leaves but then it was quite good, enough to satisfy our cravings on festive occasions here in Pardes ! Wash and soak rice for 2-3 hrs. Grind this soaked rice with soaked poha, grated coconut together to smooth paste [ the batter should be thick and spreading consistency, so avoid adding more water]. Add salt to taste. For the filling [churnu], heat ghee in a pan, grated jaggery, stir till jaggery dissolves, then add grated coconut, elaichi pwdr. Mix it well and keep aside. Clean, dry the banana leaves with soft cloth or tissue. Cut into rectangular strips. Run these strips over the gas flame one after the other for few seconds to make it pliable and then we can use it as a wrap. [if this step is missed out the leaves may tear of while folding]. Now keep the leaves aside. Once all the things are ready, place the banana leaves strips on a flat surface/ table. Spread a tbsp batter of rice paste on these strips. Take care that the rice paste should be applied as thin layer as possible and avoid applying it on the periphery of the leaves. Now take a tbsp churnu and place it in the middle of the batter lengthwise. Repeat this for all other leaves. Fold the leaf in the centre lengthwise. Press lightly around the edge of the leaf. Pile them in pedavan / steamer and steam it for 15 minutes. Allow them to cool down for another 10-15 minutes. Remove the leaf and serve the patholis warm with dollop of ghee. Note: I missed to click step wise photos for this recipe. Will update it as and when I prepare them again.